Friday September 21 is the last day of term three for our darlings, gee that went quick! Spring school holidays are a great time to get out and about on the coast and we have so many things to do and see, the only thing you’ll have to worry about is choosing which activity to do. 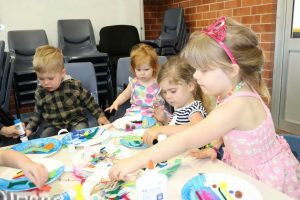 The Tin Can Bay and Rainbow Beach Library have heaps of school activities on offer. Introduce your kids to ‘Nature Weave’ at Tin Can Bay Library on September 26 from 10.30am to 11.30am and at Rainbow Beach Library from 2.30pm to 3.30pm. Make your own creations by weaving twigs, wool, string, feathers and leaves together. See how beautiful nature can be! This is a free event, suitable for children aged 5-17 years. On October 3,make your own Lagerphone or Shaker to take home at the Tin Can Bay Library between 10.30am and 11.30am and at Rainbow Beach Library between 2.30pm and 3.30pm. This is a free event for 5-17 year olds and all materials are provided. The Tin Can Bay Community Day: Kids Corner is a fantastic outing for the whole family. Visit the Tin Can Bay RSL Hall on October 5 between 9.30am and 11.30am for family fun with face painting, giant games and a jumping castle. CCYAP are running a special ‘Macro Chasing’ at the Rainbow Beach Community Hall on September 24 from 10am. Macro Chasing allows your children to hunt on a small scale, sort through a water sample to find little creatures, then make an ID. September 28, CCYAP will help your kids get their Flower Show Entries ready for the Annual Flower Show, Under 16 category. Meet at the Cooloola Cove Veterans and Community Hall from 1-2pm. Pack a blanket and some snacks and head to Lions Park in Tin Can Bay for GRC Movies in the Park, September 29. The kids will love watching ‘Captain Underpants’ under the stars! The event starts at 4pm and will include fun activities, big games, colouring in and create a comic character competition. Best dressed superheroes will be judged at 6pm. BBQ, drink and snacks available or bring a picnic and enjoy the afternoon/evening. Captain Underpants will screen at 6.30pm. October 2, HOY for Chocolate at the Cooloola Coast Veterans and Community Hall from 11am to 12noon. A fast-paced bingo style game using hearts, diamonds, clubs and spades with sweet prizes. CCYAP Rock Painting will be on October 5 at the TCB RSL Information Day, 9am to 12noon. Come down to the YAP tent and make a stone creation. All materials supplied.